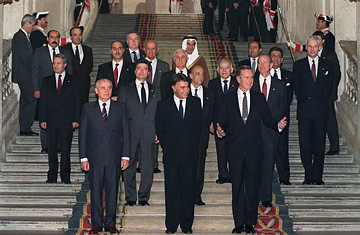 Heads of states and heads of delegations attending the Middle East Peace Conference in Madrid, October 30, 1991. Players: U.S. Secretary of State James Baker invited Israel, Syria, Lebanon, Jordan and the Palestinians to send delegations. Because Israel, at the time, refused to meet with the Palestine Liberation Organization (PLO), the Palestinian delegation was composed of individuals from the West Bank and Gaza, although they maintained constant contact with the PLO leadership in Tunis. The Agenda: The conference aimed to discuss peace plans between Israel and its neighbors, including a plan for Palestinian self-rule in the West Bank and Gaza, which would later become permanent. Regional concerns, such as the fate of the Palestinian refugees, were also discussed. Outcome: The conference achieved little by way of substantial agreement, but is more memorable for the fact that it brought together, for the first time, Israeli negotiators with those mandated by the PLO. The following year, Israel and the PLO opened independent negotiations in secret, which eventually resulted in the Oslo Accords, which in turn allowed Jordan to conclude its own peace treaty with Israel in 1994.